(2013 Jan/Feb Fic Trade) A simple cardinal triggers a happy memory for Willow. Grizzle stopped abruptly and stood, swivelling his eyes, ears and nose around to the right to point directly at the source of a bright, rich whistling sound. 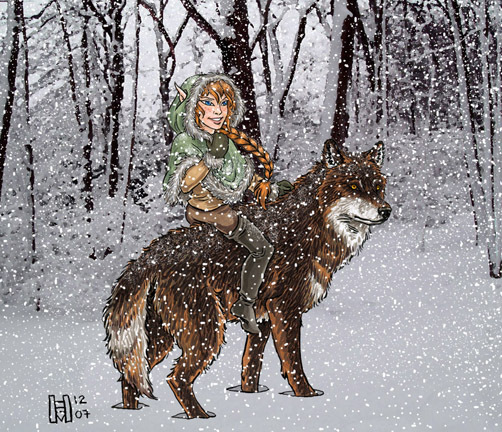 Seated on his snow-gathering back and still clutching her green hood at her throat to keep at least some of the cold and the thickly falling snowflakes out, Willow did likewise. A smile lit up her face at the sight that greeted them, while Grizzle's yellow eyes glowed with an instinctive mild predatory interest. At the top of a bare-branched tree, singing his little heart out even in the midst of a winter flurry, was a male redbird. He twisted his head this way and that, showing off his distinctive black-topped crest. His fat little red body showed against the snowy backdrop of his surroundings as clearly as bloodberries lying against a wrapstuffed bundle. "Cheery, cheery, cheery, cheeeee!" After that grand finale to his song, he was off in a swoop � presumably to return to nest and mate, as Willow thought she heard a faint reply to his song from some distance away. Grizzle had already lost interest as of the bird's departure, so Willow turned her attention back to the chore at hand. It was still light out, as she'd gotten an early start checking the traplines. She'd offered to take care of Rainpace's as well as her own that night, since he had come down with a cold. It wouldn't do him good to be outside in the crisp air while he was sick, especially when it was snowing! So she had told him to stay inside and stay warm, and he'd been only too grateful to accept. As she worked, Willow's thoughts turned back to the redbird she had seen. They were no rarity, to be sure, but unusual enough to note; and any songbird sighting in the whitecold season was always a treat. Willow was reminded of another occasion, many turns earlier, that she'd seen a redbird out in the middle of just such a winter snow. It had been just after a small, family hunt with her little brother, her parents, and good friends Notch and Rainpace. With full, warm stomachs, everyone had settled down to enjoy a peaceful after-meal chat and simply enjoy the beautiful falling snowflakes when Bowflight's sharp eye had caught sight of the brightly feathered bird. He had pointed it out, and Finch had returned its cheerful whistling song, mimicking it back note for note, which only made it sing back all the more enthusiastically. Willow's younger brother Pathmark, then less than an eight of turns old and still called Mouse, had been curious as to the bird's coloring. "Why are their feathers so bright red?" Mouse asked from where he was lying on the ground, eyes still tracking the bird above them with bright interest. "Because they eat too many dreamberries," Coyote said drowsily, not bothering to open his eyes. "That's not so!" Rainpace chided, turning to grin at his friend. "'Course it is," Coyote insisted languidly. "Same reason he's standing at the top of a tree and singing while snow falls on his silly dreamberry-drunk head! Remember that time Moss had a handful too many and took his drum to the top of the Mother Tree..."
"That's not what I meant!" Mouse interrupted, bringing the somewhat sidetracked conversation back to his initial question. "Why doesn't he try to blend in and hide from the animals that want to eat him?" Willow reached out and poked her little brother in the side with a mostly-bare rib bone she'd been continuing to gnaw. "He can't pick his feather-colors, silly. They just grow that way." "Always so sure, girl-cub of mine?" Finch teased with a fond smile for her children. Willow rolled her eyes at that, and craned her head back to regard her parents. "Mother," she replied in a long-suffering tone, "I'm not a cub anymore � haven't been for eights of turns!" "Oho!" her father, Bowflight, chuckled. "Well then, trapper, you've seen enough life to know that animals often are colored to blend in with their surroundings... Think the High Ones went running around with paint and a boar's hair brush to accomplish that?" "Yes!" Coyote agreed, suddenly alert and grinning as his eyes flashed open. "Nuh-uuh..." Rainpace muttered with a small shake of his head, idly sweeping a handful of snow off the drift he sat on � 'accidentally' onto Coyote's face. "Of course not," Willow answered her father. She looked askance at her friends who were now rolling around in the powdery snow. Above the group of elves, the redbird continued blissfully singing. He seemed unbothered by Coyote and Rainpace who were apparently having a bit of a contest as to who could get more snow down the neck of the other's leathers. Willow rolled her eyes again. No help from that quarter! Mouse, on the other hand, pushed himself up to a sitting position and folded his little arms, giving their parents a stern look that Willow recognized from their grandmother, Kestrel. His hat still laid forgotten on the snowy ground behind him. "Father, Mother, you're being silly!" "A little silliness in life is important," Finch protested, but at her son's deepening frown of arch disapproval, she relented. "But so are cubs' questions! As it turns out, Coyote may not be as far from the mark as he thinks to tease you with!" 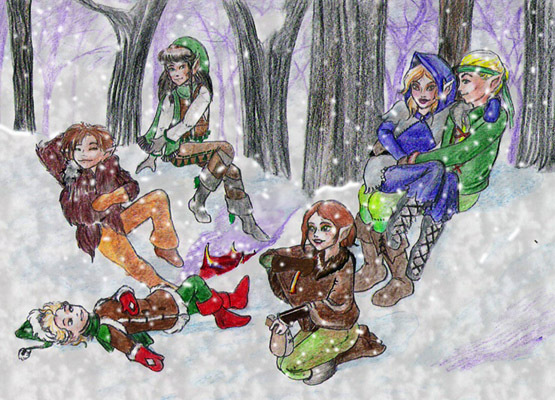 The small huntress instantly had all four of the younger elves' attention. Rainpace and Coyote even stopped mid-tussle to stare at her, the silence broken only by insistent, bright chirping. "What?" Rainpace finally asked in surprise, when he found his voice. He sat up, letting Coyote up as well. The latter, however, simply returned to relaxing on his back in the snow, though he listened to Finch with one open eye fixed on her face. "Well," Finch began, snuggling deeper into her lifemate's lap as she spoke. "I'm not sure, of course, whether it truly does work like this, but... One summer, many eights of turns ago, was a particularly good year for all sorts of berries, including dreamberries! You could hardly fall out of your den without seeing a bush of purple dreamberries or other, bright red, fruits covered with fat birds eagerly eating them, and there were still enough left over that our brewers nearly lost their minds with glee." "Followed, after they made their wines," Bowflight put in with a twinkle in his eye, "by the rest of the tribe losing their minds with drunkeness, I recall!" "But why are redbirds so bright red?" Mouse asked again, crawling on his knees over to his parents and putting his hands in his mother's lap. He jostled her legs insistently. "Birds, Mother, not wines!" he reminded her, impatient for her to get to the point. Finch laughed and patted her cub on the head. "Don't worry, dearheart, I haven't forgotten your question! That winter, after the summer with so many berries, it seemed like every redbird that was spotted had particularly bright feathers!" "Not only that," Bowflight added, "but in turns with little rain � and fewer berries � their feathers can be duller than usual, as well." The four younger elves exchanged glances filled with a shared suspicion that they were being tricked by mischevious elders. Willow had a practical solution. **Send it! ** she demanded. Bowflight smiled and obliged with an open picture-send of fat, bright red birds eating the purple berries, and then of birds with noticeably lighter, dustier red feathers sighted above in branches with brittle, dry leaves. "So it really is what they eat!" Coyote exclaimed in surprise, his expression turning sheepish as he realized he'd all but blurted out an outright admission of making up stories. "Well, it may be," Bowflight said. "It's hard to know for sure, but it certainly seems that way. Now, little Mouse, as to your other question: why would they want to be so bright instead of hidden?" Mouse nodded eagerly, his eyes wide and round as he listened to his father expectantly. "Redbirds are bold little creatures; just like wolves, they defend their territory fiercely! They don't run away and hide all the time like other food-animals, no! Why, I've even seen one nearly knock himself silly attacking his own reflection in a still-frozen patch of ice on a pond at the start of New Green!" "Little wolf-birds, I like that," Finch smiled, looking up to watch as the bird they were discussing paused to tilt his head in several directions in a series of short, sharp movements, then resumed his enthusiastic song. "Yes," Coyote agreed. "Little dreamberry-drunk wolf-birds!" Willow chuckled, making Grizzle's ears twitch back towards her briefly at the unexpected sound. Perhaps Notch had been right after all, and that redbird really was dreamberry-drunk to be out singing in the middle of a snow! Dreamberries... That gave her an idea, and she quickened her steps. Next to her, Grizzle picked up the pace as well at her cue. Willow thought she remembered that there were some as yet unclaimed dreamberries still in one of the storage dens. The daystar had risen a little while ago, and Willow was nearing the Holt again on her route. She had worked quickly and well through the night, and was now nearly finished with her task. Both sets of traps had relinquished a fairly sizable catch, and there would only be a few more to check on the way home. The night flurry had eased up sometime during the night, but had started up again a few minutes ago now, the fat snowflakes reflecting the coldly bright winter sunshine as they fell. One of the remaining traps, a simple snare near the base of a tree trunk, held a large grey squirrel. The pelt would make nice lining for a new pair of mittens � the ones Willow now wore were rubbed thin on the inside and about ready for replacing. Two of the other traps had been set off as well, but the prey had managed to escape and leave them empty. That happened often enough; Willow simply reset those for another attempt. As Willow checked the last of the traps, she caught a pair of scents and looked up. Pathmark and his wolf Bonetrail met Willow and Grizzle as their paths crossed on the way home. It appeared that her brother had had similar luck with his traps that night. "Hi, Willow! You must be tired, so why don't you let me take over your catches for storing so you can get some rest?" Willow grinned. "What about you? You're not tired?" They had reached the Holt, so brother and sister unloaded the game from their wolf-friends' backs so they could rejoin the pack for a good day's rest and socializing. "Probably not as much as you," Pathmark pointed out pragmatically. "You had twice as many traps to check." "True," Willow allowed, a bit reluctant to admit her own limitations. "I'll take care of it, then," Pathmark said firmly, making shooing motions with his hands. "Go find a nice warm den to curl up in!" 'Hmm, just what I had in mind, actually!' Willow thought. "Thanks," she finally relented, only really feeling the tired ache in her shoulders and neck once she said it. Leaving the entire catch with her younger brother, Willow made a short detour to the storage dens. Finding the small pouch she wanted in one of the bundles, she left, and then started up the Father Tree until she reached her friend Rainpace's den. Snow had accumulated on her head and shoulders, but she didn't bother to brush it away. "You awake?" Willow called out softly, not wanting to wake him if he slept. Receiving a welcoming send in the affirmative, however, Willow pulled back the leather denflap. Inside, Rainpace sat bundled up to the neck in bedfurs, looking very much as though he wondered what cruel joke of the High Ones it was that he was still alive. 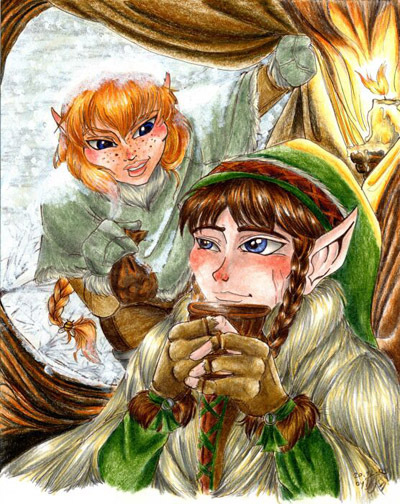 Despite the warmth inside his cozy den, his cheeks and nose were red with a touch of fever, and he looked chilled. Looking up to see Willow at his denflap, though, he smiled wanly. "Hi," he croaked out over his steaming horn of tea. It smelled like one of Cloudfern's flowery concoctions, with a hint of something warm splashed in by Starskimmer, too, most likely. Rainpace held the horn cup close under his chin, as much for the steam to help allow him to breathe through his pathetically stuffed nose at all as to keep it in close for drinking. "Pitiful," Willow joked, one side of her mouth tugging back in a wry half grin. "Don't worry, it's not that bad," she assured him, in response to his earlier expression. "You'll live, Rainpace, I promise!" "Sorry," Willow replied sincerely, hopping into the den next to her friend and pressing gently up against him to lend comfort and share warmth, letting the leather flap drop closed behind her. "Look, I brought you some dreamberries!" Rainpace smiled in thanks and took the small bag. He plucked out a few berries to chew on between sips of tea, offering the mouth of the open sack back to Willow as well to share with him. "Guess what I saw today?" Willow said, popping a single dreamberry into her mouth. "A redbird! Do you remember that time, turns ago, when we were out in this same kind of snowy weather after a hunt with Notch, my brother, and my parents, stomachs full..."